The Associated Press boss has joined the outcry over the killing and kidnapping of journalists, proposing to make it a war crime. His words come shortly after Ukraine made the list of top 5 deadliest destinations for reporters in 2014. The AP president and CEO, Gary Pruitt, pointed to the increasingly upside down nature of conflict coverage, wherein reporters used to be seen as impartial civilians covering the fighting, but have since been counted as full participants, targeted for their work. An updated legal framework should reflect this, according to Pruitt. "It used to be that when media wore PRESS emblazoned on their vest, or PRESS or MEDIA was on their vehicle, it gave them a degree of protection… But guess what: That labeling now is more likely to make them a target,” he said in a speech in Hong Kong’s Foreign Correspondents’ Club. The global statistics have shot up, with 61 dead in 2014, putting the number of journalists killed since 1992 at 1,000, according to the Committee to Protect Journalists (CPJ). The AP in particular lost four journalists on assignment last year. Meanwhile, the bloody conflict in Ukraine, which has witnessed indiscriminate shelling of civilian areas in the east by Ukrainian forces, has also taken on a political dimension, with journalists in the firing line. Last year, the Rossiya Segodnya news agency lost prolific wartime photographer Andrey Stenin to the conflict. His sterling work gave people a window on the early Maidan uprising. He was eventually killed on August 6 near Donetsk, where his convoy came under fire from government forces. Eight journalists have been killed in Ukraine in 2015 alone. Russia-based journalists became frequent targets for their work, as the video from Slavyansk below demonstrates. There is death on all sides. 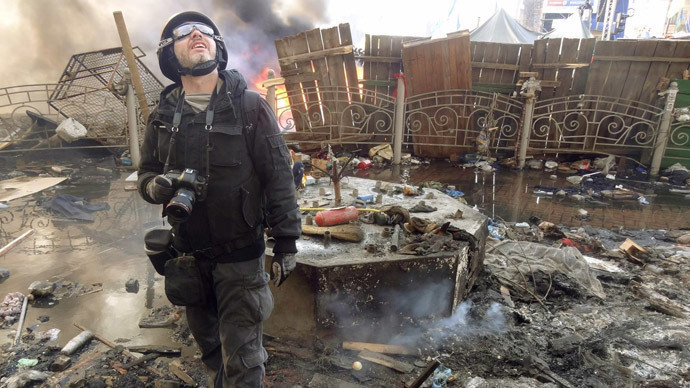 Ukraine has lost prominent wartime photographer Sergey Nikolaev, who was with the ‘Segodnya’ newspaper. He was killed during mortar fire near Peski village. The 37-year-old was accompanied by a Ukrainian Right Sector volunteer - both were not wearing flak jackets. Nikolaev became the eighth journalist to perish in the conflict, according to CPJ data. Naturally, not all deaths are a result of deliberate targeting, but the worsening trend of journalist killings doesn’t sit well with the AP chief, whose comments follow condemnation from the UN and numerous rights groups, including Human Rights Watch. Pruitt proposed creating a new protocol to the Geneva Convention, which would make targeting reporters a specific war crime. He also suggests adapting specific articles at the International Criminal Court. The AP chief’s reasoning doesn’t just revolve around the changing nature of war, but of social media itself. Its growth increasingly means that extremist groups no longer need journalists to tell their story – they’ve now got Twitter, Facebook and so on. "The larger world, however, needs us. They need us to get the real facts out or the complete story out. Not just one side as they want to tell it,” Pruitt continued. A further evolution in conflict is seen by the agency boss in hostage-taking. For militant groups it has been an invaluable source of ransom money. That includes abducting journalists and this practice has been on the increase. Taken together with developments in social media, the it also means journalists aren’t indispensable and are often used by terrorist groups to gain media attention. This can end in public beheadings, broadcast internationally, or in public humiliation, with the reporter being kept alive to report on the terrorists’ gains, as the crisis in the Middle East has shown. According to Pruitt, "a beheading becomes a bloody press release." While the majority of slain journalists are attached to prominent news outfits, the AP want to make it their mission to include freelancers, who throw themselves into the conflict without proper training, eager to report on the fighting. Such skills, together with medical training and kits, should be the new standard, according to the agency chief. Pruitt’s words follow a recent lawsuit by four journalists against the St. Louis police over their arrests during the Ferguson riots last August. They claim unlawful detention and mistreatment, which has also been on the rise lately.